Congratulations and well done to all the learners of Piet Retief Combined School who did exceptionally well during 2018 and who received an award at the school’s prestigious prize-giving ceremony, held at the Kempville Hall on Sunday, 21 October. Intermediate Phase (grade 4 – 6): Howard Sikhonze (85%) Senior Phase (grade 7 – 9): Jabulani Khumalo (83%) FET Phase (grade 10 – 12): Nokwanda Ngwenya (73%) Debate Award: Congratulations to Bapile Khanye, a grade 10-learner who participated at the District Level for debating. Spelling Bee Award: Congratulations to the two grade 5-learners who participated at the District Level, Ursula Nyawo and Khululiwe Mthupha. Best RCL Award (this award was given to one learner from grade 8 – 12, who did outstanding work throughout 2018 and maintained a positive attitude): Well done to Thobelani Khumalo, a grade 8 learner. Best Sportsman Awards (this award was given to one junior boy and girl from grade 1 – 7 and one senior boy and girl, grade 8 – 12): Junior: Sphesihle Ndlangamandla and Melusi Nthuli (both grade 4-learners) Senior: Nceba Dlamini (grade 9) and Ayanda Mhlongo (grade 11) Good Fellowship Awards (these awards went to learners who made a significant contribution towards the school. The awards were given to one junior learner, from grade 1 – 7 and one senior learner, from grade 8 – 12): Junior: Howard Sikhonze (grade 4) Senior: Sphesihle Hlatshwayo (grade 10) Finesse Award (for the first time, this award was handed over to a grade 12 girl, who has always been positive, friendly and neatly dressed): Congratulations to Lindokhule Ntshangase. 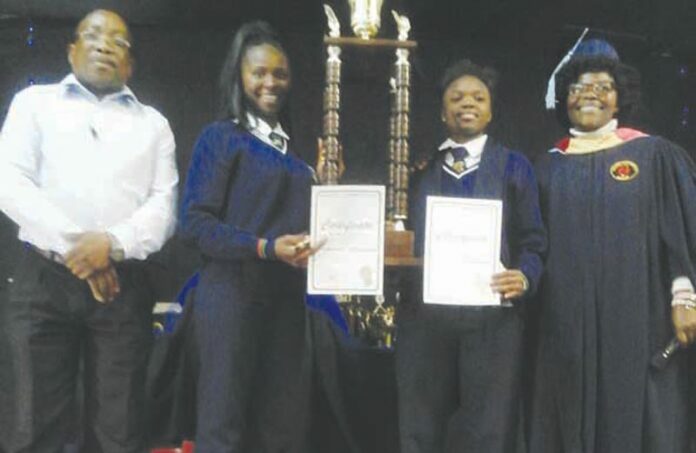 Principal Award (given to a learner with a minimum of 60% overall, despite various extracurricular activities): Well done to Boetumelo Mere (grade 12) Dux Prize (given to a grade 12-learner with the highest overall average in all subjects): Congratulations to Siwakhile Sikhondze and Boetumelo Mere. 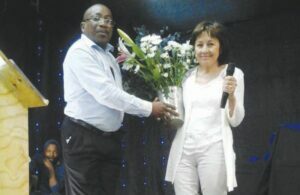 Piet Retief Combined School’s personnel and learners would like to wish Mrs Labuschagne all the best as she is retiring from the school after 25-years’ service. May your retirement be filled with many blessings, as you have been a huge blessing to numerous learners and staff members at the school. Mr Mabaso gave thanks to the parents and all the learners as well as to the organisers of the prizegiving ceremony for making the event unforgettable.